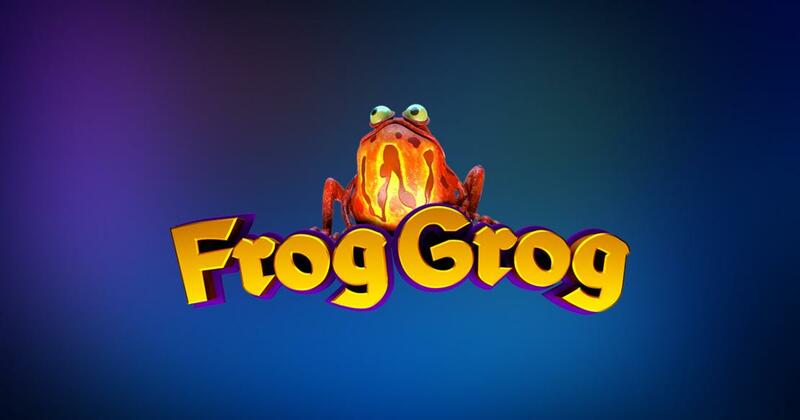 In Frog Grog, you will discover a Thunderkick slot machine with a theme that revolves around sorcery and potion making. There are plenty of magic themed slot machines out there, but how many of them can claim to have potion making and frogs as ingredients in them, not to mention the jars with eyeballs shown among the symbols? Thunderkick’s Frog Grog offers you all that, and in high-end graphics that are worthy of the newest slots. You are taken inside a wizard’s laboratory apparently, with a huge cauldron shown at the bottom of the reels. The symbols are shown on shelves, and they consist of ingredients for the cauldron. There are jars and other recipients shown, keeping inside hearts, eyeballs, red roses or live moths, along with vials of differently colored potions. It doesn’t have symbols that will stand out too much, but it’s a good design. You can expect to play on 5 reels, with 23 pay lines activated. You get 7x multipliers, dropping symbols, the Wild Frog, a random Mystery Game, plus a chance to get paid up to $7,000 by a single combo. Expect the game to have a theoretical RTP of 96.1%, which is the standard figure these days. Things don’t change much from one slot to the next, when it comes to Thunderkick’s way of setting up bets. You still have a range of $0.10 to $100 that you use, selecting the total bet directly. Like a lot of other games, Frog Grog will rely on a dropping symbols mechanic, where new symbols come to replace the ones that are part of winning combinations. With each new wave of dropping symbols, there is a bigger multiplier applied to the wins that will come next. You see this multiplier ladder next to the reels, going from x1 to x2, x3, x5 and x7. Another way to get a bigger multiplier is through the Mystery Game, at the end of which you get the number based on how many wins you had inside. The Wild Frogs are among the few symbols that stand out in this game, substitutes that will remove other symbols found on their column and row after being part of wins. The last feature is the Mystery Game, activated at random during losing rounds. It removes symbols, leaving only Frogs, Flowers and Moths to form combinations. It’s a game that excels in the feature department, though the quality of the graphics is pretty high as well.